CROSBY  At 3:54 a.m. on Fathers Day emergency crews were summoned to the Crosby Motel at 1701 Beaumont Highway. First on the scene were Harris County Sheriffs Office Deputies, followed seconds later by HCESD#5. They said smoke appeared to be coming out of two rooms upon arrival. As fire crews rolled up minutes later the entire structure was engulfed in flames, according to witnesses. A common attic and the age of the building contributed to the second floor falling into the first. 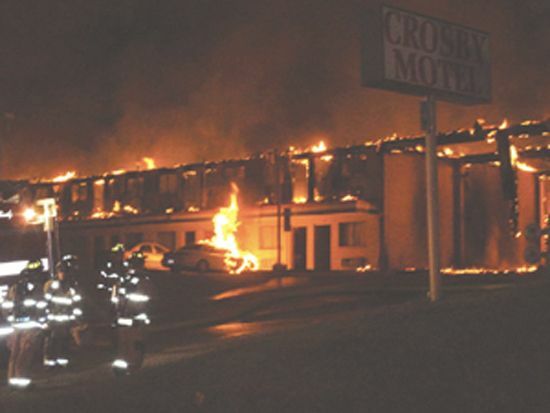 A Crosby Volunteer Fire crew personnel stated some 12 people were staying in the motel at the time of the fire. The Harris County Sheriffs Office provided a bus to take about a dozen people to Red Cross shelters and Sacred Heart. Witnesses say that deputies, paramedics, fire crews, guests and managers began knocking on doors to alert those that might be there and that the occupants were told to get out at once. They had no time to gather belongings. Seven people were treated for smoke inhalation, chest pain or heat by about 10 attending ambulance crews. According to Sheldons Emergency Service Chief. Fourteen Fire crews were counted from as far away as Beach City, Mont Belvieu and New Caney. The Chief of ESD#1 was among those treated for injuries. 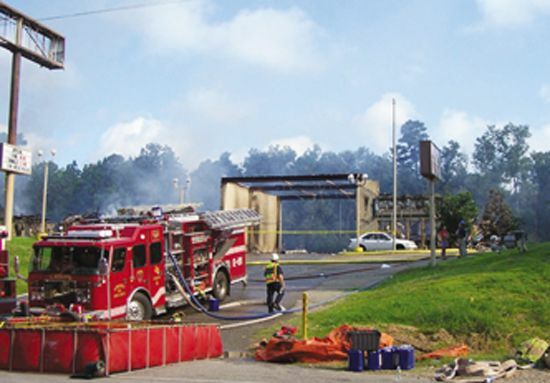 Crews appeared worn and tired at 9:00 a.m. as the blaze began to tap down. Hot spots flared during the entire day. Heavy humidity belabored crews but did little to hamper the intense flames. Some occupants jumped off the second story balcony as others simply walked out weeping. Many who had been staying inside the structure lost all that they had. The manager of the motel informed the owners of the structure early that day about the fire and stated that he believed the building was insured and expressed hope that it would be rebuilt. An early morning fire, starting about 2 am Sunday June 20, spread rapidly through most of the Crosby Motel, located on old US90 near FM2100. A total of 13 fire companies converged on the scene, which was still smoldering in the morning hours. Fire companies battled the blaze for hours, but most of the two buildings were engulfed. There were no major injuries or loss of life, but a total of 12 persons were transported to area hospitals, according to authorities. Although arson investigators and sheriff’s deputies were on the scene, no cause for the blaze has been determined. Residents of the hotel were being interviewed at press time. SEE THE STAR COURIER FOR EXCLUSIVE FIRE PHOTOS.